The Lost Salior IPA settles into a dark yellow - light amber colored body. The White frothy head was rather small, didn't last too long and didn't leave trail. It was rather weak in the nose department, but light sweet malts and a soapy aroma was noted. We were expecting a strong hop presence, but it never appeared. The initialy light bitter taste moved to a sweet finish for an average duration. 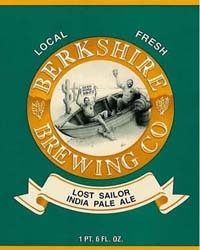 Being light in body, the lost Sailor IPA was watery on the palate with liveky carbonation. It didn't taste like an IPA. We believe that this bottle might have gone stale. The best by date was 01-23-07, but it should have held up. Reviewed on March 3rd, 2007.